Andy Nemier is a California licensed yacht sales person with 35 years of marine experience, and a self-confessed boating fanatic. All of his working life has been at sea. He is interested in all types of boats, whether trawlers, motor yachts or sailboats, though he is especially devoted to long range cruisers. The concept of a cruising couple, acting as owner operators of their own yacht and exploring to their hearts content, inspires Andy and his own experiences as a trawler owner will add great value to those considering heading out to sea. Andy’s commercial offshore career is in the international offshore energy sector where he has worked as a saturation diving superintendent, submersible pilot, and offshore oil-field representative worldwide. (A career highlight was being a saturation diver in one the world’s deepest full-recovery salvages in 1997 – Salvage of the Greek Naval Corvette, KOSTOKOS, off Piraeus Greece). Andy has also been engaged as an advisor to several government organizations, and received government funding to act as a consultant for research into health and safety improvements in the marine industry. Andy and his wife Julie, have been boating together since they moved to Canada (from England) in 1995, and have owned several sail and powerboats. They purchased a Nordhavn 62 in 2012, INFINITY and spent a year outfitting the boat to their tastes in preparation for live aboard cruising while crossing oceans. Departing Vancouver in 2013, they cruised through the USA, Mexico, and across the Pacific to Hawaii. Next they sailed south to Kiribati and onwards to French Polynesia (Bora Bora, Tahiti, Moorea, and the Tuamotus Islands). Their two adult children have joined them for several legs of their adventures. Scuba diving in the Tuamotus has so far been the highlight of their journey. By November 2016, they had made their way to New Zealand, (via Rarotonga, Tonga, & Fiji). With 16,000 nautical miles under the keel, and some recharge time in NZ, they’ll soon be on the move again. Voyage plans are being made for Melanesia, with New Caledonia, Vanuatu, and the Solomon Islands, all on the current destinations list. You can follow their adventures by going to their website blog, www.n62infinity.com. Moving into yacht sales is a natural progression for Andy who has a passion for yachts and a natural ability to create lasting relationships with fellow long range cruisers. After passing his exam to earn his California yacht sales license, Andy continues to augment his brokerage experience with professional sales training and educational programs. In 2016, Andy joined the JMYS sales team as our “roving” broker who is out there, doing it – living the trawler lifestyle. 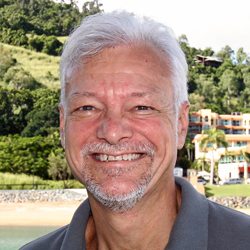 Andy will add incredible value to our international sales efforts by offering his hands-on experience, boating knowledge and warm personality to sailors and trawler owners who wish to head out to sea and view the world from the comfort of their own long range cruising yacht.